The next morning test out your dinghy and take a boat ride to shore where you can take a short bushwalk to the check out the Aboriginal cave drawings and interpretive display. This gives you a great history on our first settlers to the islands. 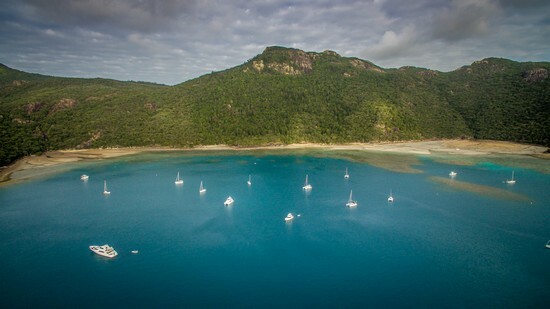 Pull up anchor and cruise out of Nara Inlet and head north to a great anchorage second night’s anchorage Stonehaven – refer map c12 page 176 100 Magic Miles. This anchorage has several mooring buoys and is great in south east winds. There are patches of coral and sandy beaches to explore. As the sun sets in the background its time to light the barbie and sit and enjoy YOUR little piece of paradise. Ghost stories and legends tell there was a great massacre in Nara Inlet, although no evidence can be found visitors have reported they heard strange noises at night. Goats roaming the hillside are usually to blame for the odd sounds, but who would know? Stonehaven Bay a great snorkeling site was named after Lord Stonehaven, Governor General of Australia, who sailed the Cumberland Isles in the vessel "Laura" back in 1926. For more history on the Whitsundays and Cumberland Islands pick up a copy of "The Last Islands" author J & M Bates. Snorkel one - three hours after the tide starts to come in for best visibility and water depth. Be aware of bullets (Wind Gusts) here, hold on to your towels!